Last week I obtained quite a bit of correspondence from Suffolk County Council under the Freedom of Information Act about the proposed Ixworth Free School and the consultation on the school re-organisation review in the Thurston area. It is worth remembering that this consultation was started by a partnership of schools in Thurston pyramid and then issued with the support of Suffolk County Council. It was started as a school led process by education professionals in the local area. Having shared this with the partnership heads this afternoon (with Matthew's permission, of course), we are concerned at the potentially confrontational tone which is suggested by this letter. We feel strongly that, as education professionals (Local Authority + Headteachers) who have thought about the detail of our plan for months, our proposal and imminent consultation process should not now be high jacked by the politicians! It is clear from the correspondence I have obtained that this is exactly what has happened. Over the course of this week I will publish all of this correspondence and write several blog posts discussing the revelations. Page 21 - I was horrified to read the text that you have (rightly) deleted - indeed it makes it clear who wrote it. Such subjective statements could have resulted in a legal challenge in many directions ! Is the photograph selected an advertisement ? Page 21 of the consultation document is about Thurston Community College and it is clear that these remarks are directed at Helen Wilson. 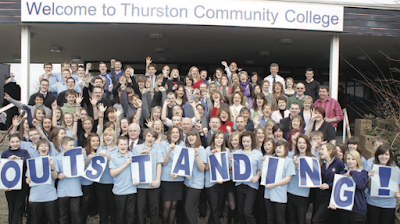 The photograph referred to is a picture of the school celebrating its "outstanding" Ofsted judgement in 2010. Quite why this is referred to in this tone I have no idea. I would have thought she would want to celebrate the success of Suffolk's schools. The object of this suggestion is to make the Free School option feel like more of an attractive and attainable objective, which I think will ensure we are fully supported by Matthew Hancock. This level of political interference would be a concern even if this was just a County Council proposal. But it is not. This is a school-led process. The local schools referred to as "they" by Cllr Spicer. It is clear that these schools have had concerns about this interference and these concerns seem to be well supported by the evidence. Tomorrow I will detail the "deal" done by politicians behind closed doors that appears to have already decided the future of education in the Thurston area.